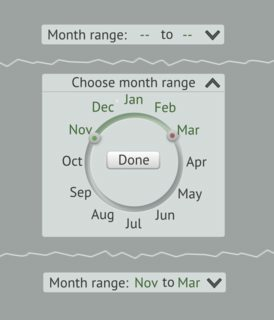 I want to offer the users a way to select a range of months within a year. 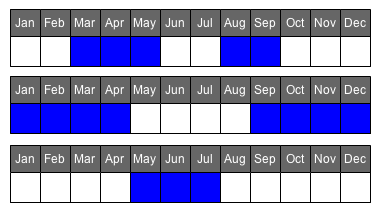 The selected months are used to display a table of data. The control should be placed above the table and since vertical space is limited, it shouldn't take up much vertical space. 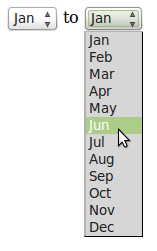 That has as problem that it is not clear which months are selected. 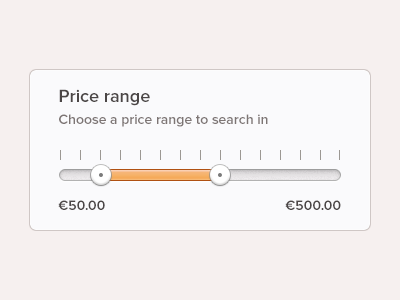 It offers the possibility that people could select a broken range (which is allowed but most likely not wanted). That does seem a little overkill for just twelve options. What control could I use? I think if you are selecting a single range within a single year you can keep it super simple (and easy to use) with a pair of select boxes. If you are asking for data that usually follows a particular format, then ask for it in that format. Visually people are used to months shown in a calendar, so show it in a calendar, and let them select the months that they want. Visually it is very easy for someone to see whether they have the months that they want like that. Here is a quick example of what it could look like with three examples of different data entered. As long as it truly is within a single year, a range slider seems appropriate here. The date range picker on the google finance site solves the problem with my previous answer. This example doesn't "snap" to month increments, but a different implementation certainly could. If a range of months could span across the year end, perhaps a circular dial makes more sense. 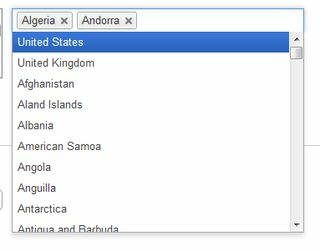 Since you have limited vertical space it would have to be a dropdown though. What about a type of slider control, but with a start handle and end handle? This control will clearly illustrate that they can only select a range of concurrent dates (and not randomly select dates, as either of the options you've shown above implies). 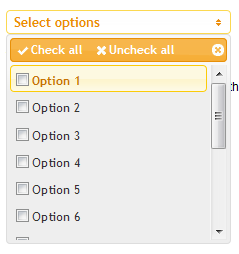 A multi-select dropdown with check box, will serve your purpose. Its simple and intuitive. Not the answer you're looking for? Browse other questions tagged website-design web-app dates multi-selection range or ask your own question. How to display month name in a small form? What control should I use to indicate multi-select lists on iOS?